Photo by Michael Kelly Dania Atwat, a sixth-grader from Marietta Middle School, studies a list of words in preparation for the Marietta Times Regional Spelling Bee. She is one of 60 competitors listed to compete today in the regional with the winner advancing to the Scripps National Spelling Bee in Washington, D.C.
MARIETTA — The Marietta Times Regional Spelling Bee will be held 7 p.m. today with five dozen students from around the region competing for a shot at the Scripps National Spelling Bee in May in Washington, D.C. Competitors have been conditioning for the annual contest, building up their vocabulary muscles, studying word structures, origin and definitions and learning to remain calm in preparation for the Regional Spelling Bee at the Marietta High School auditorium. The entries represent 13 school districts, all of which are enrolled as Scripps National Spelling Bee Institutions. Students must be under 15 as of Aug. 31 and enrolled in eighth grade or lower as of Feb. 1. For those who can’t watch the contest in person, The Marietta Times will carry a live broadcast on its Facebook page. Dania Atwat, 11, a student at Marietta Middle School, said she’s been preparing day and night for the bee. She advanced from district to regional last year, but got knocked out at that level. Her nemesis words were paradigm and lederhosen. 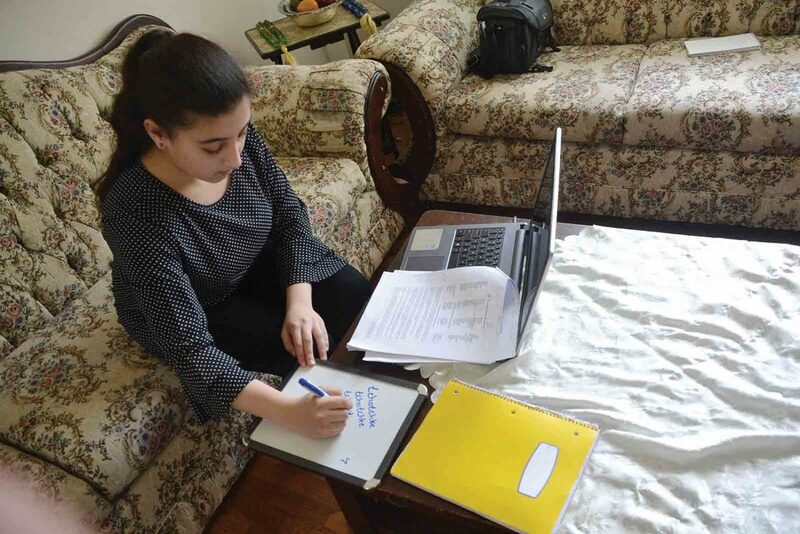 Atwat studies alone, with the help of her mother, Maieda Al-Waked, and sometimes in the library with other spelling bee students. She said she was nervous going into the regional competition last year, but that experience has improved her outlook. Treven Nicholson, a 12-year-old competitor in the sixth grade at Beverly-Center Elementary in the Fort Frye district, is facing the regional contest for the first time. Nicholson said that although it’s his first time and he’s “pretty nervous,” it’s a good experience. “I just feel like it’s entertaining. It will really be nice to see what I can accomplish,” he said. Cate Edgell, an 11-year-old sixth grader at Warren Middle School, said she competed at the school level last year, but didn’t go to the regionals. She’s working to keep her anxiety in check. For the regional finals, Christina Myer, executive editor of The Marietta Times and The Parkersburg News and Sentinel, will be the emcee and Marietta College President William Ruud will be the pronouncer. The judging panel is made up of Washington County Career Center Superintendent Dennis Blatt, Marietta College professor Judy Ruud and Janelle Patterson, a reporter for The Marietta Times. The benefits of competing in a bee are numerous and long-lasting, she said. Many of the spellers study as a group. “They’re learning to work with each other, and they learn that competition doesn’t necessarily mean going it alone, that they can work together even though they’re competing against each other,’ Myer said. Myer said many volunteers and veterans of organizing the annual spelling bee helped prepare for the event. Jim Spanner is publisher of The Marietta Times and The Parkersburg News and Sentinel. The Scripps National Spelling Bee began in 1925, led by the Louisville (Ky.) Courier-Journal in collaboration with nine other papers. Sponsorship was taken over by the E.W. Scripps Co. in 1941. Except for the war years of 1943-45, the bee has been held annually for 93 years, with co-champions declared in five of those years. Of the champions, 48 have been girls and 45 have been boys. In many years, the national finals have been broadcast live on network television. * Unable to attend? Watch the Bee live on The Marietta Times Facebook page.